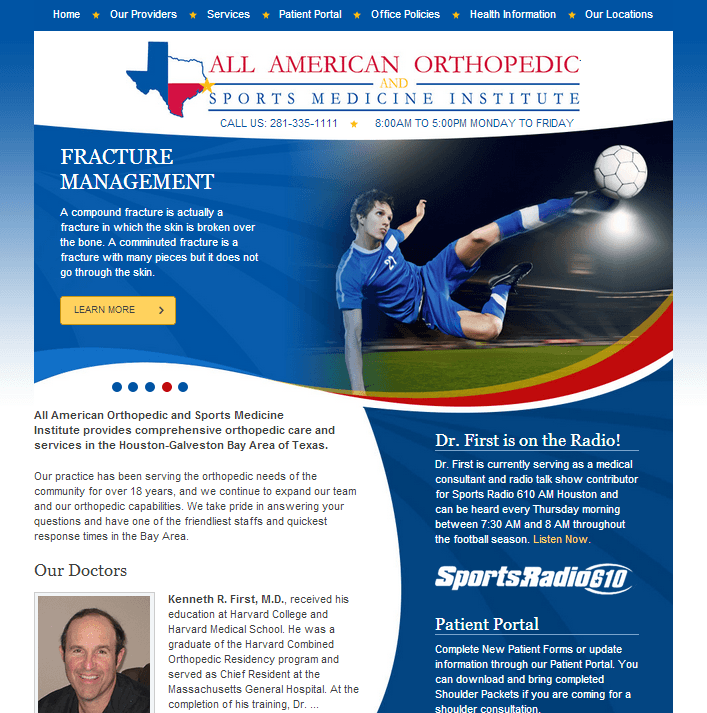 All American Orthopedic‘s previous website was created using a template that was originally designed to give their patients automated access into their system. They wanted something simple that would allow patients to enter in their information prior to the appointment and reduce wasted patient/doctor time. Unfortunately, that system was never set up properly and the template became broken in the process. They then sought out a new solution to present their professionalism and expertise in the medical industry as well as to communicate better with their patients. We incorporated their current branding with a very modern custom medical website design to showcase their new portal, their physicians, and the services they provide. This came together as an attractive site that has easy-to-navigate pages and allows access to their newly created patient portal. Additionally, we created a custom stand-alone mobile website to ensure that their current and potential patients would have access to their information on the go as well.